The annual E3 event took place earlier this week and it didn’t disappoint. Sony, Microsoft, EA and more announced loads of new games and even a couple of consoles! It was only a matter of time until Microsoft or Sony unveiled a small version of their latest consoles, and Microsoft is first to the punch. 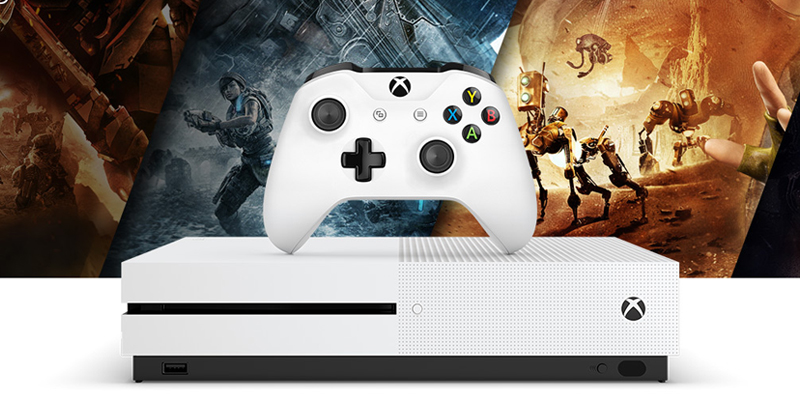 The Xbox One S is 40% smaller than its big brother, which is great news for those who aren’t keen on the original monolithic black box. Size isn’t the only difference however. The One S plays 4K video and Blu-Rays, delivering eye-pleasingly clear movies and TV shows, and comes with a new Bluetooth controller with double the range. Microsoft also unveiled a whopping 2TB storage option, although the One S is also available in 1TB and 500GB too. Prices start from £249, going up to £349 for the 2TB version. The One S wasn’t the only new console unveiled at E3 though, with Microsoft offering the first insight into Project Scorpio – a supercharged version of the Xbox One which can run 4K games, supports virtual reality and has six teraflops of power, which sounds very impressive even if we’re not entirely sure what it means. It’s set for release late next year, but don’t worry if you’ve just bought an Xbox One: Phil Spencer, the head of Xbox, was keen to emphasise that all Xbox One games would be compatible and Xbox’s Head of Marketing Aaron Greenberg has stated there will be no Project Scorpio exclusives. Sony didn’t reveal the PS4 Neo, their Project Scorpio equivalent (although it’s definitely happening), but they did share more details about PlayStation VR, set for release later this year. Over 50 games will be available to play this year, ranging from submissions in existing titles to brand new games. Among the highlights were a VR X-Wing mission in Star Wars: Battlefront, Batman: Arkham VR, in which players solve crimes through the eyes of the Dark Knight, and a new version of a beloved franchise (more on that later). PlayStation VR will be released on the 13th October and it’ll cost £349. Best get saving. After the hugely divisive Resident Evil 6, which replaced the slow-burn dread of the first few games with in-your-face action, it was hard to tell where the series would go next. Now we know. Resident Evil 7 is a first person horror that doubles up as a VR experience. Players explore what looks like a desolate house that we’re guessing is full of zombies and other nasties. It looks similar to Outlast and the hugely popular P.T, which can only be a good thing. You can play a demo of Resident Evil 7 right now on PlayStation Plus. Keep a spare pair of pants handy. Hideo Kojima, the mastermind behind Metal Gear Solid, established a new studio earlier this year and unveiled its first project at E3. True to form, it’s really weird. The first you’ll notice from the trailer is that the main character is played by Norman Reedus AKA Daryl Dixon from The Walking Dead, and that’s he completely naked. Fortunately, this isn’t an adaptation of a TWD fan-fic; instead, Norm wakes up on a beach full of dead crabs with broken handcuffs and a baby connected to him by a cord. He picks up the baby, cuddles it and it…erm, disappears. Then we see loads of dead whales and people floating in the sky and oil and…yeah. We’ve got no idea what’s happening. A lot of people have come up with theories though, ranging from Reedus being dead (a theory classic) to something to do with black holes based on the equations on Norm’s dogtags. What we do know is that Death Stranding doesn’t have a game engine yet, so it’s a long way off. Still, count us intrigued. And now for something a bit more familiar: a new God of War! Kratos is back, although he’s looking a bit older and has a massive beard. He’s also brought his son along for the ride, although he seems pretty useless – especially when he accidentally shoots Kratos in the shoulder with an arrow by accident. History’s hardest man shrugs it off, naturally. We’re expecting more of the same epic battles and adventuring, with some RPG elements thrown in for good measure. We’re guessing the relationship between Kratos and mini-Kratos will play a big part too. After years in the wilderness, The Last Guardian was finally unveiled at last year’s E3. Now, we’ve been given a release date too – October 2016, over 7 years after it was first announced. We were also treated to a new trailer, which shows a young chap and his dog-bird companion Trico exploring a dungeon and poor old Trico looking a bit sad. Sony aren’t revealing too much about The Last Guardian, but it looks like it’ll be an epic, beautiful weepie in the same vein as ICO and Shadow of the Colossus. Rumours of a new Crash Bandicoot have rumbled for the past few months, and now we have confirmation: gaming’s greatest comeback is on! The beloved PlayStation platforming hero is returning in not one but three remasters: the original Crash Bandicoot, Crash Bandicoot 2 and Crash Bandicoot: Warped. If you were wondering why Skyrim isn’t backwards compatible on the Xbox One yet, here’s your answer: Bethesda are releasing a remastered version for PS4, Xbox One and PC on the 28th October. The epic action RPG has received a major graphics boost and you’ll also be able to use mods on console for the first time too. Shouting at dragons has never looked so good. Following the success of Star Wars: Battlefront, it’s no surprise EA are planning even more Star Wars games. They previewed a couple at E3, the most exciting of which is an action adventure directed by Amy Henning, the creative director behind the first three Uncharted games. By the looks of it, the new Star Wars will share a lot in common with Uncharted, but we’re not complaining – it looks awesome. With the brilliant Unravel under their belt, EA are shifting their focus to another indie title. Fe is a platform/puzzler developed by Zoink, a 20 person studio from Sweden. Fe casts you as a young cub who goes on a journey of self discovery through a forest. Along the way, he learns that everything in life is connected and learns songs from animals and plants. It sounds incredibly new age but hey: it beats another shooty-shooty bang-bang game! FIFA often gets flack for not changing much year-to-year, but FIFA 17 could be a genuine revolution. First off, EA Sports have moved to a new game engine – Frostbite. This is the same engine used by DICE for Battlefield and EA Sports have promised some gameplay improvements as a result. Early impressions suggest reworked set pieces, new shot types and better shielding of the ball, although we’re sure there will be more. However, we’re most intrigued by The Journey, a new game mode in which players guide a young footballer through his career on and off the pitch. This includes talking to other players and managers using a Mass Effect-style dialogue wheel, hitting certain targets and taking part in matches. Play well, and you’ll hit the top. Play badly, and you’ll end up as League Two journeyman. It’s FIFA: The RPG basically. We’ve already seen a lot of Battlefield 1 in action, although E3 offered a glimpse at some new gameplay and also gave us the chance to see how good Snoop Dogg, Jamie Foxx and Zac Efron are at it. We’re particularly excited to commandeer some of the new vehicles, which include motorcycles, biplanes, zeppelins and horses, although we’re sure we can bear the sadness when our horse inevitably ends up getting shot. Nevertheless, this could be the year Battlefield beats Call of Duty. The sequel to the much-loved sneak-n-slasher looks absolutely incredible. Words don’t do it justice; just watch the trailer! What do you think of this year’s E3 announcements, and what are you looking forward to most? Let us know in the comments! It’s going to be an expensive year with so many great games coming out. Start saving now by selling games and consoles with musicMagpie; we’ll give you an instant price and pay you as soon as your items arrive!